When it comes to consumer preference in smartphones nothing beats Android. With each passing day, its user base is growing stronger. Android phones are affordable, available in all price ranges and are user friendly. A considerable part of our time is spent on our phone, but we still miss out on exploring many features that it offers. 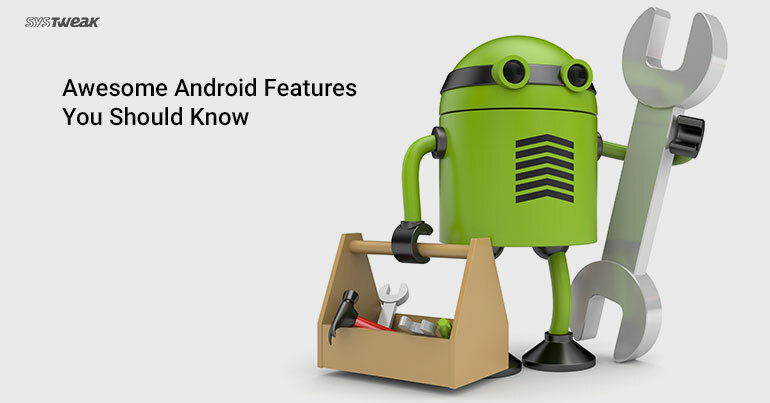 Here, we share with you, certain tricks and hidden features of your Android phone. It is possible that some features may work differently on different versions of Android, but you should give it a try and see what they bring for you. Sometimes the Android phone freezes or stops working. The normal instinct is to take out the phone battery to reboot it. However, most of the recently launched Android phones do not give this option. You can try to reboot your device by pressing: Power Button+ Home Key + Volume up button simultaneously. In most of the cases it will reboot the device. A day without our favorite search engine Google is unimaginable! One click and we have all the answers. You can now access Google search quickly in a single click. All that is required is to press: menu key and hold it for couple of seconds. This will launch the Google search. Once you do this, the device will hunt down the problem causing application and will show a confirmation message about rebooting it in safe mode. When we reboot Android in this mode, all the 3rd party applications are disabled. This helps the phone to work properly. The availability of this feature depends on the device you use. Only if your device has face detection will this feature work. To activate it: Go to Settings > Security > Screen lock > Face unlock. An additional layer of security now protects your phone which will work only when the face is matched and you blink your eyes. Blinking your eyes tells the Android security system that the person is alive and that it is not an illegal attempt to unlock, using a still image. Use this handy USSD to get details about battery usage, DNS check, Ping, Application time, usage time etc. a) Factory reset: There are times when a phone needs to be formatted, that is, back to original factory settings. All the internal data of your phone will be deleted. To factory reset a phone dial *#*#7780#*#*. b) Hard reset: Hard reset will delete all the settings and data stored on both internal and external storage. To do so dial *2767*3855#. Don’t try this code for testing purpose, as it will not ask for any confirmation. If you want to customize your phone and want additional options to do so, long press on the screen. The context menu is similar to the right click menu you get on most of the operating systems. Did you know, you can take screenshot on your Android without using any 3rd party application? Although, the procedure of taking screenshot varies from one Android version to another version, you can take screenshot on most of the device using the following steps: Press volume down button and power button together. Are you worried, about the data usage on your Android? To keep a tab, you can decide and set a data limit for your device. To do so, navigate to Settings menu and select the option ‘Data Usage’. This will show you a graph which depicts the data usage on your device by all the applications. From here you can set warnings for data limits, set cycles for monitoring data usage and enable or disable data usage in your device. Have you cleared all your notifications without seeing them? There is a very simple way to see them again. Go to widgets, move “settings shortcut” onto your home screen and select notifications there. Now you can see the Notifications shortcut on your home screen. You probably know that when you swipe down from the top of your Android handset’s home screen launches the notifications menu. Did you know though that throwing a second finger into the mix brings quick settings to the front? If you want to save your time and a second swipe, use double-digit motion to see Wi-Fi controls, screen casting options and Bluetooth shortcuts at your fingertips. To keep unwanted curious eyes away from your screen, you need to lock your phone. But when you’re alone it can be tiresome to unlock time and again. You can set your phone to automatically unlock when you’re relaxing. In Settings, go to Security >> Trust Agents >> Smart Lock. Activating this will allow you to set parameters for when you want your device to ditch the passcode. Using these simple tricks, you can get best of your phone. Also, these tips will make using your phone fun. Just give them a try and see the magic.